According to CSIL research report The European market for office acoustic solutions, acoustic aspect is becoming more and more relevant in the office business lied not only to the noise absorption but also to the sound management. The total acoustic panel surfaces currently consumed in the European office furniture business is estimated to account 2,250 thousands sqm, mainly used for producing continuous wall panels, free standing screens, high partitions, acoustic patches, cabinet doors, desk dividing screens and the so-called “cocoons”. The weight of acoustic solutions on the office furniture industry is expected to increase significantly during the next years. The European market for office acoustic solutions report analyses the acoustic trend in the office furniture market with a focus on acoustic panels by kind of applications and leading European players in this segment, with brand positioning by specialization and offered solution. The incidence of acoustic solutions in the office furniture business is expected to expand significantly during the next years. According to the majority of the interviewees (77%) sales in the acoustic segment will increase more rapidly than the office furniture sector in general. In fact, besides a small group of companies, which pioneered in acoustics more than 20 years ago (ex. Abstracta with Softline in 1981), there is a relevant number of players which introduced acoustic solutions in the past five years (around 50% of the sample interviewed). 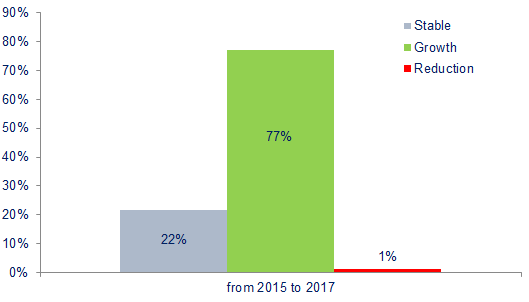 Another 30% announced the presentation of new products in 2014 while a 20% expects to launch acoustic products in portfolio within 2015 for the first time.